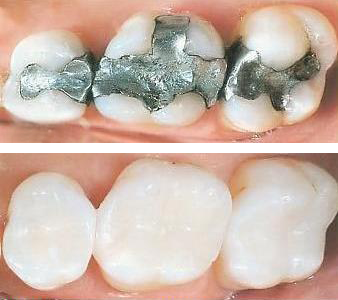 Everyone is familiar with a silver filling or officially known as an amalgam. They are still used today but we haven’t placed one in our office since the 90’s. We only do tooth colored composite fillings. They look great and last many years. A crown is used to restore a tooth when the remaining tooth structure isn’t strong enough to support a filling. We utilize Cerec technology for most crowns so they are entirely tooth colored and completed in a single appointment. A dental implant is as close to literally replacing a tooth as you can get. They have been around for decades but really became mainstream within the last 10 years or so. 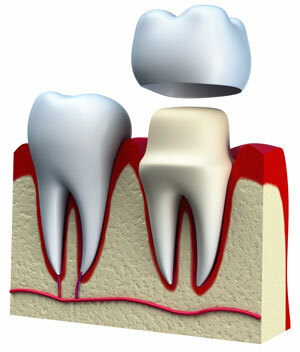 An implant is placed exactly where the root of a tooth would go into the bone. Over a few months the implant fuses to the bone and then we can attach various restorations to it depending on the circumstance. Implants can replace one tooth or several implants can be placed to replace an entire arch or even stabilize a denture. We welcome children of all ages to our practice. We recommend a first exam by the age of 3. We can, and prefer, sooner but most infants just don’t cooperate enough until the age of 3. One tactic that works well is to have the child at an earlier age accompany their parents when they come in for hygiene visits. That way they get familiar with the environment without having to do anything. We let the child sit on the parents lap or even just give a ride in the chair. Sometimes it takes a few visits for them to warm up to us in the white coats but they eventually do. If I can stress one thing to parents is to FLOSS in between their child’s back teeth. That is where most children under the age of six get cavities. We do provide full denture services. Today, dentures can take several forms. Dentures were always known for being loose and a real nuisance. Today we can combine dentures with implants to anchor the denture in place. It actually makes doing dentures fun again. This area of dentistry has come a long way in the last few years. Gone are the partial dentures that were made of ugly metal clasps that you would see wrapped around someone’s teeth. Today the materials are light, flexible, and best of all, tooth and gum colored. They can be used to replace multiple teeth or just one tooth. We offer Emergency dental treatments almost every single day we are open. We offer after-hours accessibility as well. Emergency dental treatments are responded to as quickly as we can. Although we cannot realistically respond or treat immediately 24/7/365 we try to make arrangements for coverage. When immediate treatment is needed we recommend visiting a local hospital’s emergency room that is open 24/7/365. We provide a lot of tooth extraction services including surgical one. We also provide socket preservation which helps maintain the bone after a tooth is removed that would otherwise be lost. This is particularly important if an implant may be in the future. We know having a tooth extracted or teeth removed may make you feel uncomfortable but we use the latest technology and sedation services are available to calm nervousness. TMJ simply stands for the name of the joint (TemporoMandibular Joint) TMD stands for TemporoMandibular Disorder. People who suffer from TMD know it. Quite simply their jaw joint hurts. There are MANY causes that lead to TMD including clenching and grinding your teeth. TMD problems are similar to back problems in that there are many causes and many treatments but the goal is to relieve the pain. Several people suffer from headaches that are caused by TMD. Due to the numerous causes and treatments feel free to schedule a no-fee consultation to discuss your specific issues. Commonly known as “laughing gas” it’s inhaled through the nose and provides a slight but significant amount of sedation to allow you to relax. It works almost immediately (versus waiting for a pill to kick in) and wears off minutes after it’s stopped. You can also eat normally and drive yourself to and from your appointment. A root canal is needed when the nerve of a tooth dies or is in the process of dying. People often associate the term “Root Canal” with pain and the truth is that the Root Canal procedure RELIEVES the pain. Today’s technology allows the procedure to be as pain free as any dental procedure. In our office we refer most root canal treatments to specialists known as Endodontists as they are experts and highly skilled.